Consider adding NuCalm to your routine. Using NuCalm in the morning or mid-day can make up for poor sleep quality the night before, and may provide you with the restorative benefits of 2 hours of sleep in just 20 minutes! It also resets your sleep-wake cycle and GABAergic inhibitory system to prime you for a good night’s rest later on. Go outside and get some natural sunlight during the day. This realigns your circadian rhythms and your biological clock to help you stay awake during the day and get to sleep at night. NuCalm is also a great tool to help reset these rhythms. Avoid caffeine late in the day. Caffeine is a stimulant and will block the action of sleep-related chemicals in the brain. Try the 20-min NuCalm Power Nap as an alternative and natural “pick-me-up” in the afternoon. Improve your sleeping environment. At night, darken your room with blinds or curtains to cue your brain that it’s time for sleep. Ensure that your room temperature is not too warm to allow your body temperature to cool down before sleep. Similarly, NuCalm blocks light and brings you into a parasympathetic dominant (“rest-and-digest”) state where your body temperature naturally decreases to prep you for a good rest. We all know that a good night’s rest is vital for your health; it’s your body’s chance to rejuvenate and reset itself. However, did you know that sleep is also the time when your brain stores memories, strengthens neural connections, and clears away unnecessary information? It’s the time when space is made for learning. Learning is the process in which the brain acquires new or modifies existing knowledge, behaviors, skills, or preferences. During the day, as you process new information from life’s experiences, temporary connections are made between different neurons in the brain forming short-term memories. Over the course of the day, the unnecessary connections from arbitrary information are marked for recycling. At night when you sleep, your brain’s janitor cells, the microglia, remove these labeled synapses that hold unimportant information to make space for the development of stronger connections that code for the important stuff. Long-term memories are formed through more secure and more efficient neural pathways. When you wake up, your head is clearer and ready to start the learning process anew. Read this article to learn more about how sleep helps the learning process unfold. NUCALM SESSIONS ARE AVAILABLE AT LOTUSRAIN CLINIC. CALL THE OFFICE AT 619-239-5433 TO SCHEDULE. APPTS AVAILABLE MONDAYS TO THURSDAYS AND MOST SATURDAYS. 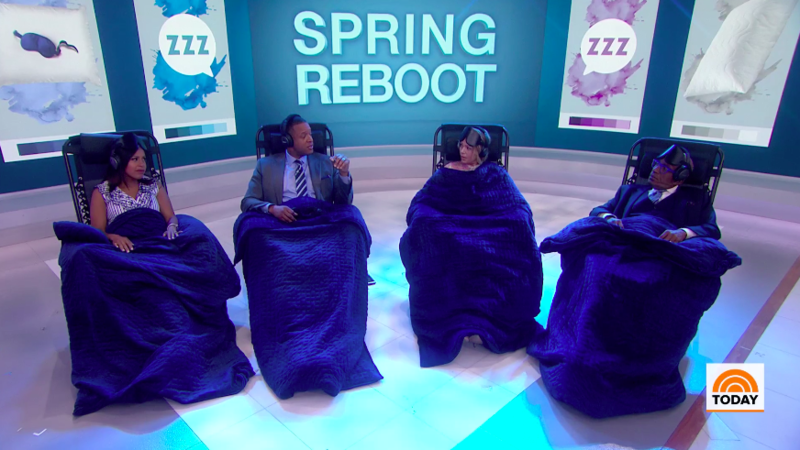 If you missed the TODAY show on Wednesday, April 10, watch below to learn how ReCOVER wowed the TODAY show’s anchor, Craig Melvin, with NuCalm and the ultimate spring reboot! ReCOVER is the first of its kind place in the heart of midtown Manhattan that focuses on human recovery and restoration. They have been pioneering the importance of recovery and restoration and helping thousands of influential New Yorkers recover, restore, relieve stress, and improve their sleep quality with NuCalm. 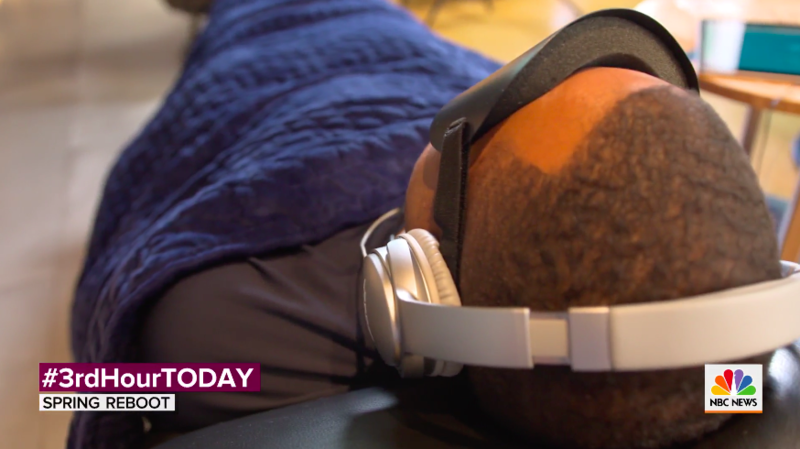 Owner Aaron Drogoszewski led the TODAY show’s anchor, Craig Melvin, through a couple of their recovery technologies including their CVAC compression chamber and their number one selling service, NuCalm. Melvin was amazed by how stress-free and energized he felt after only 30 minutes of NuCalm. And his colleagues were impressed to learn that 20-minutes of NuCalm may be equivalent to over 2 hours of restorative sleep. They were all ready to try NuCalm – and get that much-needed spring reboot too! NuCalm is the world’s only patented, clinically proven neuroscience to manage your stress and improve your sleep quality without drugs or side effects. Call us today at 877.668.2256 to find out how you too can get the ultimate spring reboot with NuCalm! NUCALM IS AVAILABLE AT LOTUSRAIN CLINIC. CALL OUR OFFICE AT 619-239-5433 TO SCHEDULE. APPTS AVAILABLE MONDAY TO THURSDAY AND MOST SATURDAYS. February was National Children’s Dental Health Month, in which the American Dental Association raises awareness about the importance of children’s oral health. It is vital that children learn from an early age to develop good dental habits by brushing, flossing, and getting regular checkups. Mouths, gums, and teeth free of bad bacteria and structurally aligned help immune function and respiration among other things. It is necessary to educate families and young children about the importance of oral health, to not only set them up for a lifetime of healthy teeth and gums but also to help them overcome their unease of visiting the dentist. If you have children, you probably know it’s not always easy getting them to the dentist. A dental appointment likely triggers an innate stress response in your child, as it does for you, because it goes against their primal instinct of protecting their mouth – their one source of food and communication. However, as children are less emotionally developed, this stress response is often expressed as kicking and screaming in the dentist’s lobby. NuCalm offers a solution to dental anxiety not only in adults but also in children ages 5 and up! This drug-free neurotechnology eliminates the stress response within minutes by kickstarting natural relaxation processes in the brain. It can bring your children into a blissfully unaware state to distract them from the dental checkup completely. This will help not only your dentist and you as a parent, but also your children, as they will create more positive memories of the dentist and benefit from the restorative properties of NuCalm too! Check out our website to learn more about how NuCalm works. We offer NuCalm sessions at LotusRain. Call the office to schedule yours and experience a tremendous feeling of calm, peace and well-being. As many of you are aware, NuCalm was originally invented to treat acute Post-Traumatic Stress Disorder (PTSD). We all know someone suffering from addiction or PTSD, and we all struggle with finding ways to help them. Blake DeLoach tells his story here about the sacrifices he made to serve his country, living with his war wounds and how NuCalm is continuing to provide relief for his unseen injuries. In March, 2007, Blake was seriously injured for the first time while serving in Iraq. “I got blown up,” he deadpans. “I was on patrol walking down a street in South Baghdad when an IED (improvised explosive device) blew up about ten feet in front of me.” Despite suffering a shoulder injury and trauma to his brain, “I pushed through the mission, and then returned home later that month, in time for my second son to be born.” His respite home was short-lived, however. Two weeks later, Blake was back in Iraq “pushing through more missions” despite lingering problems with his shoulder. “Every time I would put on my gear, my arm would go numb,” he says. Eventually, it was determined that because of his injury he was experiencing poor circulation in both his arm and shoulder. As a result, he was medevaced home in June of that year, where he underwent intensive therapy to rebuild his shoulder. It was during this time that Blake first began to experience symptoms of post-traumatic stress disorder (PTSD). They manifested when he found himself unable to be around his infant sons when they cried. Their cries were too much for him cope with because while in Iraq the opposition forces regularly played recordings of babies crying and screaming. The memories of that triggered Blake’s response to his own children’s cries. “I couldn’t bear to be around them when they cried because it bothered me so deeply,” he says. Before much longer, Blake’s enlistment in the Army was coming to an end, but because of his desire to continue to serve his country, he wanted to re-enlist. Meanwhile, his wife again got pregnant and his third son was born in February, 2008. Blake re-enlisted so that he could continue to look out for his fellow Army colleagues and new recruits arriving in combat zones for the first time. “During my first tour of duty, none of us in my unit knew what to expect once we got to Iraq,” Blake explains. “I re-enlisted specifically so that I could help my new unit better prepare for what they might face over there. We were a smooth, solid unit, just a good group of guys. I was glad to be with them because the military was my heart, but it was also hard for me because I was unable to spend much time with my children. I think I was only able to be with them on their birthdays twice during that time” due to how life is in the military. When Blake returned to Afghanistan he was assigned to a personal security detachment detail, where he was responsible for protecting a high ranking officer. “But I didn’t want to leave my unit,” he says. “Those guys were like family.” So, Blake did all he could to spend time with them while in Afghanistan. The prelude to the next major tragedy to strike Blake occurred on his birthday in October 2010. That day, he called his ex-wife hoping to be able to speak with his sons. She refused to let them come to the phone, telling him that she wanted him “to hurry up and get shot in the face and die” because she didn’t want to have anything to do with him. Three days later, October 18, 2010, Blake was assigned to accompany the officer he guarded to meet with local Afghani elders as part of a community outreach detail. But he soon discovered that the soldier assigned to replace him in his unit wasn’t even awake, let alone dressed and ready to accompany them on their next mission. Knowing that his unit was already short of men due to some of them being away on leave, Blake asked for and was granted permission to instead accompany his unit in what was supposed to be “just a simple mission”. It wasn’t. Blake also could not talk because part of his jaw had also been fragmented. “Every time I tried to say something, some of my teeth would fall out.” Despite his extensive, serious injuries, when his unit returned to base he refused help until he could assist his squad members out of the vehicle. Only then did he allow himself to be placed on a stretcher and taken inside for care. Because of the severity of his life-threatening wounds, Blake was put into an induced coma, both to spare him from his pain, and in the hopes that he would somehow pull through. While in this unconscious state, Blake was visited by a general, who asked him if he was all right. “Apparently, when he asked me that, I was told that I gave him a thumbs up,” Blake chuckles. But Blake was far from all right. Days later, when he was finally brought out of his coma, his eyes were taped shut. He was told the doctors were unsure of his hearing, especially in his right ear, which had suffered the most damage from the grenade’s explosion. Nor were the doctors sure how well he would ever talk again because Blake had lost fifteen percent of his jawbone structure, as well as eight teeth. He’d also had a bad reaction to the anesthesia he’d been administered, leaving him with limited mobility, along with serious muscle loss. “I couldn’t even hold my head up,” Blake says.ut the biggest blow came when Blake was told he had lost his vision. The attack had left Blake irreversibly blind in both eyes. Blake left the hospital in December 2010, and continued to undergo therapy in Augusta, Georgia. During that entire time, his ex-wife refused to allow him to see or even speak to his sons, something she continues to do to this day. It was a terrible blow to Blake, on top of everything else he was enduring, yet with the characteristic courage and determination that by now Blake was becoming known for, he persevered. It was during his rehabilitation that Blake met Lauren, the woman he is now married to. Lauren was one of his instructors during his rehab therapy. “When we met I felt like I’d known her my whole life,” Blake smiles. Lauren was the first person who Blake felt loved him for who he is. “I didn’t know how to react to that at first,” he admits. He and Lauren took things slow in the beginning, starting out as friends. Eventually, though, they started dating and that led to the happy and fulfilling marriage that Blake once doubted would ever be his. Blake continued to abuse painkillers on and off for another two years, but Lauren’s love for him finally led to break free of his addiction in 2016. “I did it on my own,” Blake says. “I went cold turkey, going through tremors, shakes, puking, all of that.” This lasted for seven brutal days. Since that time, Blake has maintained his sobriety. In his quest to continue to improve his health and maintain his sobriety, Blake began going to the gym to work out. He quickly discovered how much he loved doing so, especially lifting weights. As a result, Blake became a power lifter and now competes in competitions. “It’s such an amazing feeling to know I’m sweating because I’m doing something good and healthy for myself,” he enthuses. When asked if he has any regrets, Blake immediately replies, “No. Because if I hadn’t done what I did, I wouldn’t be where I am now, which is a pretty awesome spot.” Even after triumphing over all of the tragedies and other challenges he has faced, Blake is not one to rest on his laurels. Instead, he continues to set new goals for himself while remaining focused on enjoying and appreciating the life he has created with his wife Lauren. Another significant benefit Blake has experienced since he began using NuCalm regularly is improved quality of sleep. “I can tell that my sleep is better when I use NuCalm compared to the times that I don’t use it,” he says. Even more importantly, Blake reports that NuCalm has changed the quality of his dreams, which previously could devolve into night terrors. For a long time, when I would dream everything would spin really, really badly. I looked that up and discovered that the interpretation of that sensation in dreams is because you feel that things in your life, the outside circumstances, are spinning outside of your control and the dreams are reflecting that. Since I got clean and started working with NuCalm with Dr. Kaufman and then on my own I don’t have that spinning or anything like that in my dreams. It’s very rare that I have any sort of night terror at all.” Blake’s dreams have also become more vivid. In them, he can see, and he often dreams he is telling people that he has his vision. Obesity not only is an independent risk factor of postmenopausal breast cancer (BC), and in particular oestrogen receptor-positive/progesterone receptor-positive BC, it is also a prognostic factor of the disease. Substantial evidence has shown that obesity, as measured by body mass index (BMI) is linked to BC outcomes. All-cause and BC-specific mortality risk increase for each BMI unit increase in pre- and postmenopausal BC survivors is estimated to range from 8 to 29 %, depending on when BMI is ascertained. Current evidence on treatment toxicity supports the guidelines from the American Society for Clinical Oncology, which recommends the use of full weight-based chemotherapy to treat obese cancer patients. Several studies have shown that lifestyle interventions are feasible and safe; more research is needed on specific diets for health maintenance and weight loss in BC survivors. Chan, D.S., & Norat, T. Obesity and breast cancer: not only a risk factor of the disease. Curr Treat Options Oncol. 2015 May;16(5):22. doi: 10.1007/s11864-015-0341-9.